Belafonte d'Avalon is the result of some of the best sport horse and German Riding Pony breeding in the world. His dam, Mata Hari, is by our jumper stallion, Mannhattan and out of the pony mare, Idealiste. Idealiste was 14:1 hands tall, out of Kathy's endurance racing Anglo Arabian mare and by the Oldenburg stallion, Ideal. 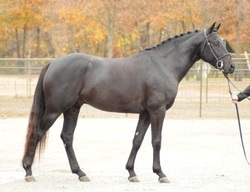 Belafonte's sire is the German Riding pony, Hilkens Black Delight. 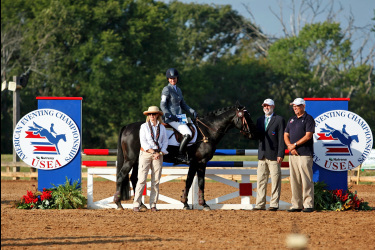 Hilkens Black Delight, a Weser-Ems stallion, won the 2005 Weser-Ems licensing and was the first pony ever to be invited to the Oldenburger Stallion's Parade where he received a standing ovation and was described as being "as close to perfection as possible". He has been described by the licensing committee as the most stunning pony they have seen for at least 6 years since his sire, Branduardi M won the licensing. Belafonte is following in his father's footsteps in receiving similar praise for his outstanding conformation, movement and character. Belafonte went on to fulfill his performance requirement by attending the 30 Day Pony Stallion Testing in October of 2010. He again wow'd the judges with his enthusiastic and "can do" attitude and successfully completed the testing with one of the highest scores ever awarded both in North America and in Europe. 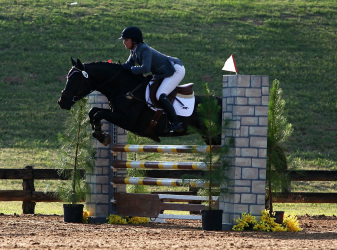 Belafonte is currently competing in eventing under the expert skill and training of Rebecca Brown of RB Riding. The pair were undefeated in 6 out 7 times out and finished 2013 as Area V Champions at Training Level, 8th at Training at the AEC's. Belafonte is fully licensed and approved with the Rheinland Pfalz-Saar, Westfalen, Weser-Ems, Sport Pony Studbook Society - SPSS (UK), International Sporthorse Registry - Pony Division and Le Cheval de Sport Belge (sBs). For more information, please contact us at kathy@avalon-equine.com or 720-272-5998. Join Belafonte d'Avalon on Facebook! Follow the link below!